Hardboil eggs*, then peel. Slice in half length-wise. Remove yolks and place in bowl. Add all ingredients together. If mix seems dry, add more mayo. Spoon mix into egg halves. Garnish by sprinkling with paprika. For variations: Add finely chopped onion and/or dill relish (omitting onion powder.) 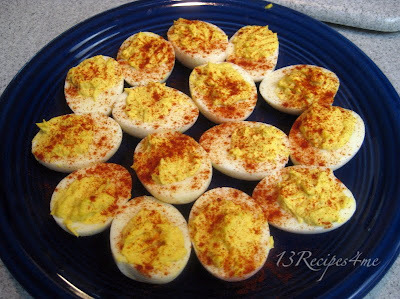 If you prefer a sweeter egg, use sweet pickle relish and cut the mustard back to 1 1/2 tsp. *To hardboil eggs: Place eggs in pan and cover with water. Turn heat on high until water begins to boil. Turn heat down so that it is a softer boil/simmer. Cook 15 minutes. Cool in cold water, then refrigerate if not using immediately. Joanne, what does it mean if the yokes turn green? Did I boil them too long? Yes, Ann, usually it is cooking them too long or too high of heat that causes that. My mom always boils them to death, lol, and we always would have the green edge around the yoke. Doesn't hurt anything, although the yoke get tougher the longer it is cooked. Woohoo! I made these tonite (the sweet version) and they are WONDERFUL!! :) Thanks, Joanne!